Among the advantages to living in the Des Moines area is our high density of unique restaurants. (Based on state licenses, there are well over 2,000 restaurants in the metro area...or about one restaurant for every 200 people.) On one hand, you can find yourself waiting for hours to get seated at popular chain restaurants -- ever tried getting a table at Texas Roadhouse on a Friday night? And, sometimes, that wait is well worth it. On the other hand, it's nice to be able to get into a place like Cool Basil (one of the best Thai restaurants around) any night of the week with practically no waiting. 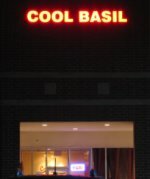 Never been to Cool Basil, you say? Then find your way to its peculiar strip-mall location (right by Toys 'R' Us and Half-Price Books in Clive) and be amazed. There's not a bad item on the menu, and as long as you order the mildest preparations, you'll be pleased even if you aren't into spicy foods. One star (out of five) is still enough to give you a little kick. The prices are better than reasonable, they're outstanding. $25 will get you two entrees and a plate of terrific crab rangoon. And the only excuse for leaving hungry is having the metabolic rate of Bruce Banner. Listed below are links to blogs that reference this entry: Suit and Thai. This page contains a single entry by Brian Gongol published on November 13, 2007 5:59 PM. Don't let campaign season make you gullible was the previous entry in this blog. Radar love is the next entry in this blog.